We pushed ourselves to the limit—and burned a few calories in the process. The 'saratoga living' team, pre-workout at Vent Fitness Studio. As a regular gym-goer, I feel like I take pretty good care of my body. I’ve had a gym membership for the last 20 years, run a few times a week, lift some weights and stretch quite a bit. (I even meditate daily, if that counts.) I average about 3-5 days at Planet Fitness per week, which isn’t bad for a 38-year-old dude. I mean, I’m not logging the amount of reps I was when I was 21—and I sure as heck don’t want to get “ripped” like I did at 18. But I am actively trying to avoid the doctor’s office at all costs—and I absolutely hate feeling out of shape. At Vent Fitness Studio on Tuesday, March 6, I felt desperately out of shape. 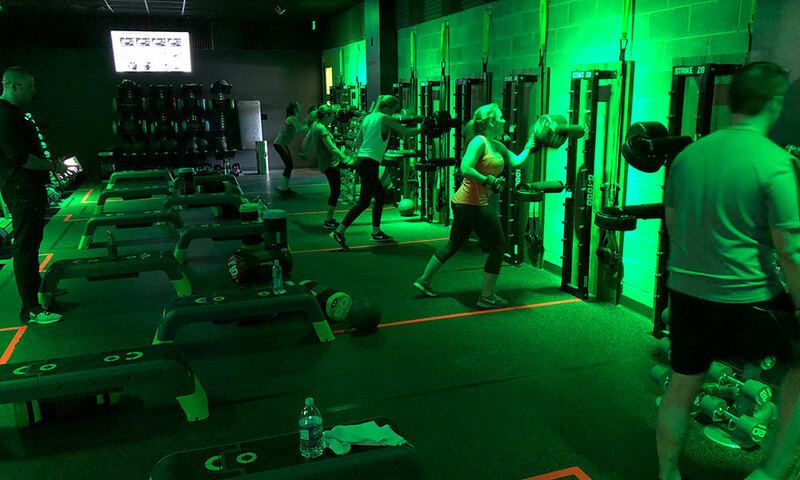 The saratoga living staff engaged in a little friendly team building (and competition) at Vent Fitness Studio on Broadway in Saratoga Springs. The five of us—that is, Sara Francese, Chelsea Moore, Becky Kendall, Natalie Moore and I—took an hourlong class at the Studio together. We went in colleagues, and left soldiers. The ‘saratoga living’ team getting its kickboxing on. 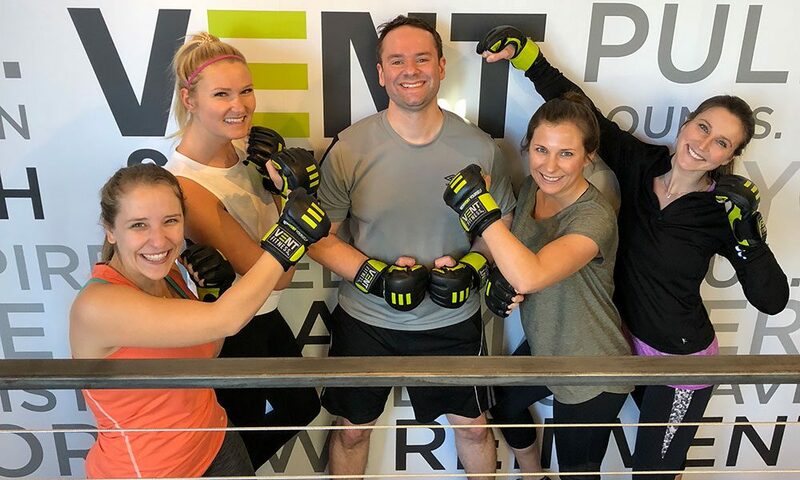 The afternoon’s workout regimen—which was hosted by Vent trainers Doug and Mike—kicked off with some tame appetizers, such as invisible rope-jumping in place and burpees to get our heart rates up. But shortly after, was the main event: In the dimly lit fitness room (see above), our team was introduced to a trio of body-busting circuits that included multi-speed treadmill running (walk, jog, all-out sprint); myriad repetitions of sit-ups and push-ups (of all shapes and sizes); and kickboxing-like combinations. (With every gloved-punch, I pictured Microsoft Word prompting me to update it every five minutes.) By round two, I was wheezing and had a visible sweat semicircle on my gym shirt; by round three, to quote Duncan Sheik, I was barely breathing. All the while, mind you, each of us had a heart-rate monitor strapped around our bare chests, with our vitals and “trophy points” flashing up on a big screen. (That’s basically the currency in the Vent Fitness Studio workout room; if you’re lacking in “trophy points,” you’re winning backwards.) The other way of knowing whether you’re winning or not was if your screen was green. If it flashed to red, then, well, you were a champ. Look, at the end of the day, none of us left that workout studio a loser. We all worked as hard as we possibly could, and when it was over, as much as I felt like I wanted to vomit, I also knew I’d accomplished something Herculean. It’s not every day you get forced to your limit, physically. Especially, in front of your co-workers. Now, as I sit here and write this, my mind is as sharp as a knife, and while I’m not looking forward to the multi-Advil-swallowing pain I’m going to be experiencing tomorrow morning, I do know this: I’m going to sleep like a baby tonight.